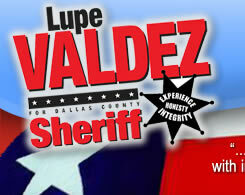 Thanks to Dazzle Camoflage for the link to this uplifting news: Lupe Valdez, an out Lesbian, a Latina, and a Democrat, made history by winning a highly competitive race to become the new Dallas County Sheriff! In the primary on March 9, 2004, Lupe came in first against three male opponents, and then she received 70% of the vote in the resulting run-off election. Luz's victory is a welcome sign of the fact that Dallas County is starting to trend Democratic, from under 43% in 1998 to 47.5%in 2002. Luz was endorsed by the Latino community, the Dallas Stonewall Democrats, the AFL-CIO, and local Teamsters and labor unions. She is the first Latina, and the first openly LGBT official to serve in the Dallas County Government! After my past few sad, serious posts, I am trying to stand-by my "Silver Lining" post and learn more about the positive election results right now. More soon. that's good stuff. i've heard other good stuff about some local elections, so i guess there is a silver lining. That is damn good news. Where'd Seyd's blog [http://ethno-queer.com] go? He should be all over that. Despite the depressing federal elections, we had some important change take place here in San Diego. Plenty of places to start the wind that will make the wave.